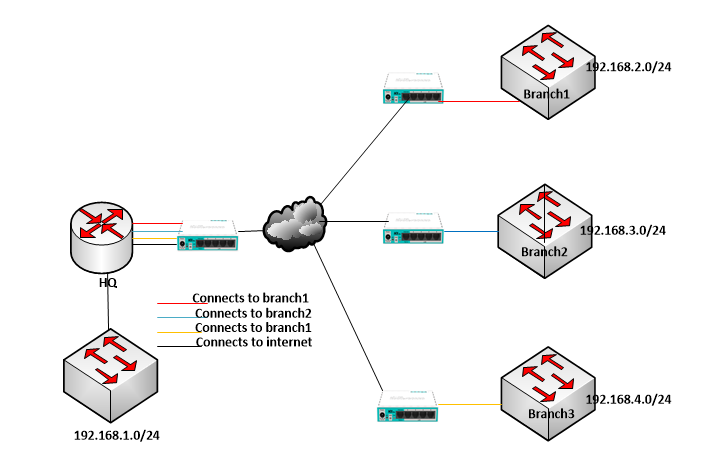 In this Lab, I will be sharing with us my jobs on how to deploy eiop in a hub and spoke topology to connect multiple branch offices to the Main Office. This is a set up I have done for my customers, for this reason you got to be very attentive and carefully follow my steps, change you IP where necessary but stick to the procedures, I assure you that you will not find it difficult implementing this technology. 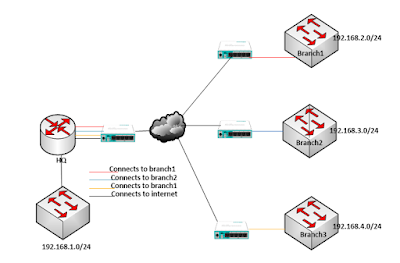 I will be personally dealing with network administrators, who are administering networks with many branch offices that are connected together via one ISP circuit, and if you are so lucky, your ISP is using Mikrotik brand equipments, setting up eoip, or mpls tunnels to link your branches for me will be much easier. In this demonstration, we will be connecting three branch offices to the HQ. Since we are using physical interfaces, the number of sites will be a determining factor in choosing the type of Mikrotik router that will used for this project. With that in mind, I will be using the RB750 with 5 dedicated ports. The eoip router (RB750) are configured and managed by the ISP. This demonstration shows want goes on in that ISP cloud. Use eoip to provide our client with a circuit that connects all three branches to the HQ. Our solution will aid on file sharing and collaboration among offices, reduce operational expenses and help increase productivity. Next, Mikrotik eoip configuration on the Hub. Next, we create bridges and add an eiop interface and the corresponding ports on the RB750 to each bridge. See below. Next is to configure the spokes at all branches. Note that on the spoke routers, ether1 is configured to connect to the ISP cloud while ether2, shown in the configuration is used to deliver layer2 services. Finally, we configure the HQ router to provide connectivities to all branches via the ISP-delivered layer2 links. Four cables will be dropped by the ISP at the HQ; one for internet (layer3) and three for layer2 connectivities to be branches. We will also configre dhcp servers on the HQ to provide IP addresses for hosts on the HQ LAN and those connected to the switches at all branches. At this stage, we configure four dhcp servers to handle IP address leasing for HQ_LAN and all brach offices networks. See below. Repeat steps for the branch offices. Implementing Mikrotik MPLS vpls Setup For Three offices. ← Antivirus and Anti-malware Software Management.